The prompt for Tara’s Gallery this week was A Smile. This is the photo I chose. 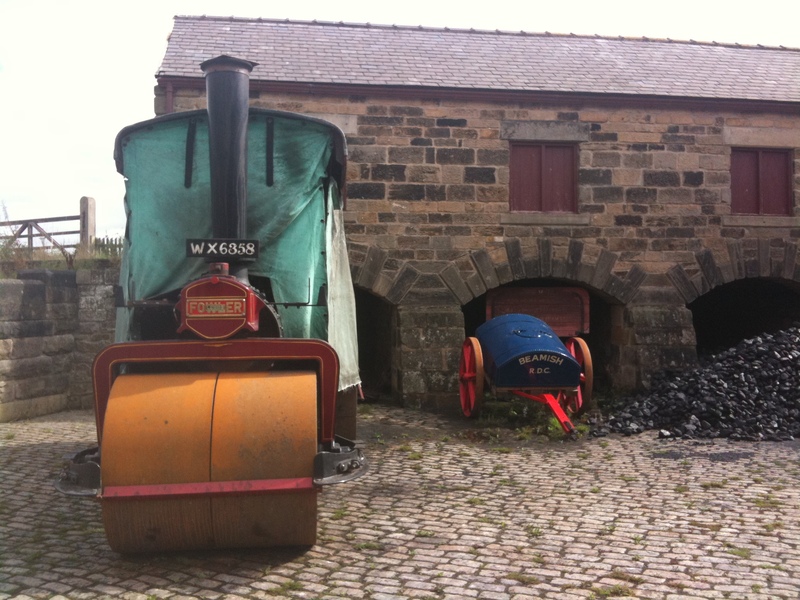 I didn’t take it especially this week, but I did take it myself with the proper camera on a family trip to Beamish Museum a couple of weeks ago. As you can see, my son has the best smile a baby ever had! In the week of the first papal visit to the UK in almost 30 years, I’ve been reading a lot about religion on the web. My ‘real life’ friend Alex was published in the Guardian and bloggers discussed religion too, including a great post from Muddling Along Mummy. This week seems to be a good time to talk a bit about my relationship with the Church. My mother is a Catholic, as are her family. My father is vaguely Christian, although I’ve never asked whether he actually believes in any of it. My brother and I were raised Catholics. I started my attendance at weekly mass as a babe in arms. As a toddler I quietly curled up in the pew with my colouring books and by the time I was five I knew the prayers and rituals off by heart. At my Catholic primary school I prayed every day and had my First Confession and First Holy Communion with the rest of my class. However, from an early age I had an enquiring mind, and the ideas we were taught didn’t always sit right with me. I remember asking my mother one day how we knew that the Bible was true. It was an old book from long ago, so how did we know that it wasn’t just a story like Sleeping Beauty, and that we hadn’t all got the wrong idea? I can’t remember just how old I was, but we were walking through the village to church from our first house, so I can’t have been more than seven. In my final year of primary school, we took the sacrament of Confirmation. For those who don’t know, Confirmation involves reaffirming your affiliation to the Church; it’s like a second baptism, but the important part is that you’re of an age to choose. Usually it happens when you’re a young teenager, but but in my parish they do it when you’re 10. I remember having real doubts. I wasn’t confident in my faith and I didn’t really want to be confirmed, but at ten years old, when everyone in your class is doing it and everyone expects you to just get on with it, there was no way I had the courage to say no. If they’d offered it when I was thirteen, I like to think I might have done. I went on to a Catholic secondary school, stayed there all the way through to sixth form, and had a thoroughly excellent education which I’m really grateful for. As a mild-mannered, geeky, clever girl, I had a nice group of friends, several of whom were much more convinced by religion and faith than I was. In the first year of sixth form, some of them went on a pilgrimage to Lourdes, accompanying disabled pilgrims from our diocese and working in the ‘hospital’ there. They worked hard and played hard, getting to know the Lourdes nightlife well. When the opportunity came up for me to go along the following year, I decided to go for it. If I couldn’t forge a relationship with God in one of the holiest places on earth, then that would be it: it was my ‘now or never’ moment. The trip was great. It was bloody hard work: pushing heavy wheelchairs around a hilly town in the sweltering heat, making small talk with the (often grumpy and demanding) elderly occupants of said wheelchairs is not to be undertaken lightly. Especially with a raging hangover. But we were young and fresh-faced and took it in our stride. I really learned a lot from the people I met; some of them had an amazing attitude to life, and an inspirational approach to faith. Near the end of the week, we had the opportunity to visit the baths. The queue was like waiting for a theme park ride: it snaked back and forth in an orderly manner, with dozens of people patiently waiting their turn. When we reached the top we were split into groups – girls went one way, boys went the other. I was pushing the wheelchair of a lovely lady whose name I sadly can’t remember now; as we queued she told me about her granddaughter’s music lessons. We were guided with a group into a small changing area and provided with black sheets to cover up as we removed all our clothes. Somehow my friends had ended up in a different room, so it was me, this lady and a group of strangers. I wriggled out of my clothes under the sheet (at 18 I didn’t have the confidence, or perhaps indifference, that I have to displaying my body in changing rooms these days). We waited our turn and soon I was ushered into the chamber. The rest was a blur. I can’t remember where I went to get my clothes back – I don’t think it was the room I started in, but I can’t be sure. I know that as I stepped back outside into the fresh air and bright sunshine, I cried. I was shaking and lightheaded, totally overwhelmed by the experience. Maybe this was it, I thought, maybe that intense moment in there, under the water with the nuns chanting around me, was my religious experience. Maybe I had connected with God. But, of course, the more I thought about it, the more I felt that my experience gave the opposite of the proof I was looking for. I’d been naked and vulnerable, been asked to think about my deepest wants and regrets, and been dunked in a pool of water surrounded by iconic religious imagery. Of course I was going to have an intense experience: the adrenaline rush was immense. I thought, if I need all of this theatre to connect with God, then I don’t think he’s really there for me at all. Sometimes I really envy religious people. I can see the comfort that religion can bring, especially in times of hardship and loss. I think it’s wonderful that religion gives a sense of community and place to so many. I just can’t bring myself, with my logical mind, to make that leap of faith. As for a pilgrimage to Lourdes, I’d recommend it to anybody. It’s a crazy place, full of loving, interesting and interested people, but also overrun by wonderfully tacky tourist tat. There can’t be many places where you can take home a Virgin Mary snowglobe or glow-in-the-dark rosary beads as a souvenir. Lourdes is a real spectacle and experience and I’m so glad that I took the plunge and went there, even if I didn’t find what I was looking for. Disclaimer: this was nearly ten years ago, how I’ve described it is how it is in my memory, but in reality the baths might be a little different. I’d love to hear the experiences of anyone else who’s been there and done it. 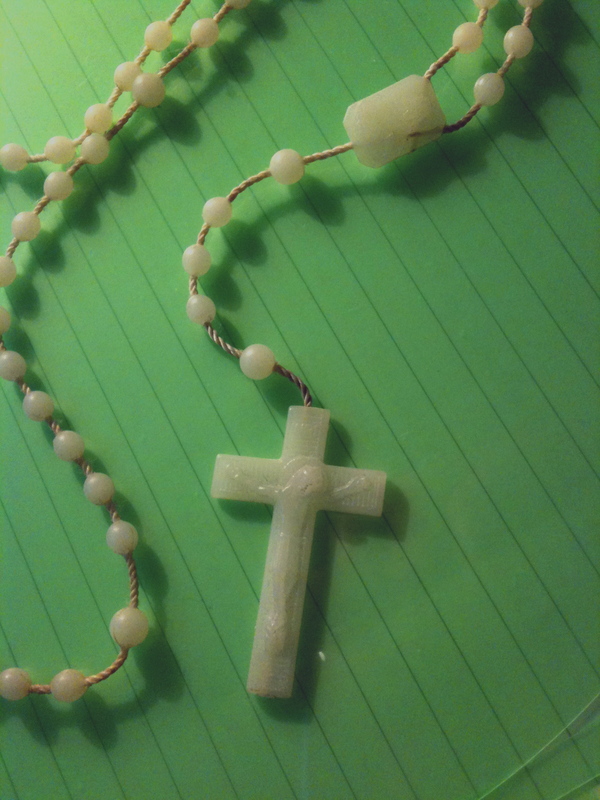 And yes, those are my glow-in-the-dark rosary beads, snapped and edited with my iPhone. Boys, girls… what’s the difference? I read an interesting post today on The Blog Up North about the new addition to Jamie Oliver’s family. After three girls, Jamie’s wife has just given birth to a boy. Apparently Jamie will be pleased, as he reportedly said during the pregnancy that “it would be great to have a boy, as I am in a totally oestrogen-filled house”. Garry’s post got me thinking about my own gender preferences and about gender preference in general. In all honesty, when I was pregnant with my first I would have preferred a girl. I’m one of two, an older sister with a younger brother, and naively as I’d grown up I imagined that my family would turn out just the same. I was also drawn to the idea of a little girl as my little companion. And of course I looked forward to dressing her in fashionable, pretty clothes. My husband had a preference for a girl too (although now, I can’t remember why). 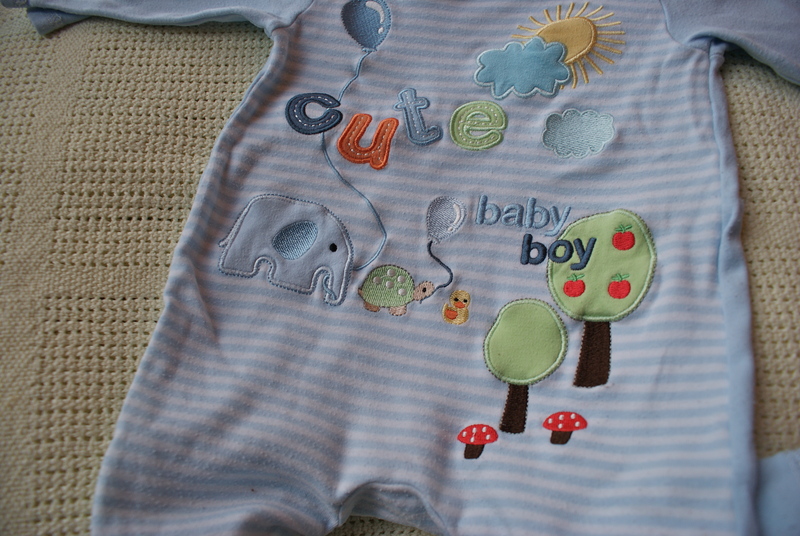 So that we wouldn’t be disappointed, we referred to the baby as “he” and convinced ourselves that our firstborn would be male. 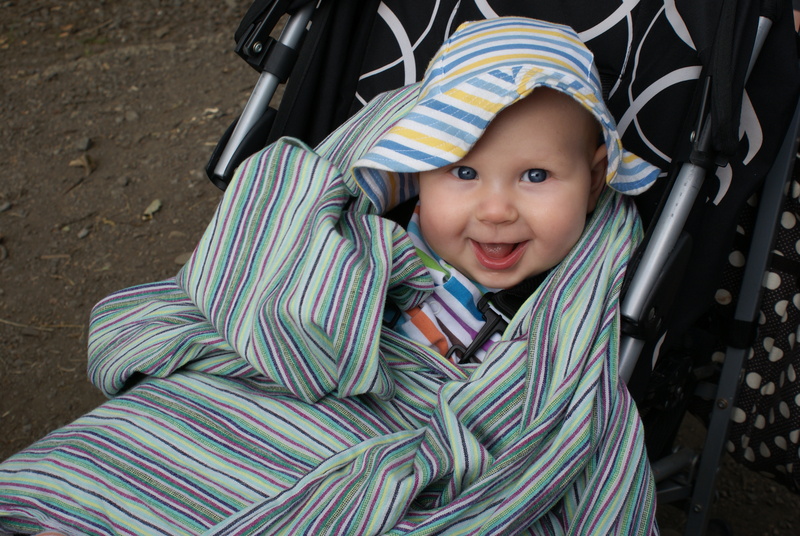 Yet when my little boy was pulled forcefully into the world and plonked on my chest, I stared at him in total surprise. Deep down, I had still hoped for a girl. My disappointment was very short-lived (as in, a matter of moments!). I quickly fell head over heels in love with my baby. As he’s grown, I’ve realised that my expectations were all wrong. The characteristics that I’d imagined in a boy, the things that put me off, haven’t really materialised. 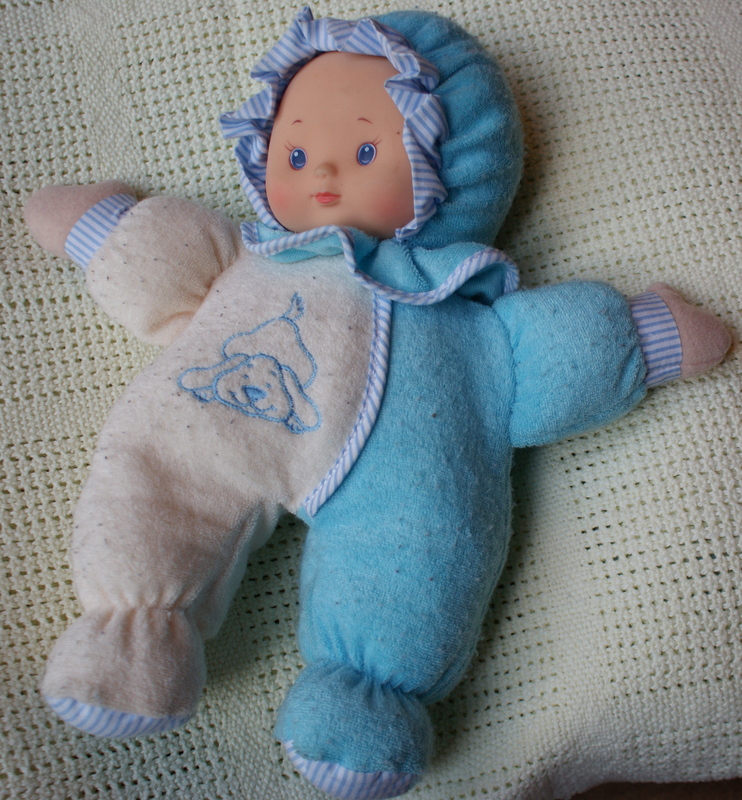 Yes, he can be boisterous and energetic, but he also loves books, craft and cuddling his dolls. As his personality develops more and more, I identify less and less with parents who have a strong preference for a particular gender. The dad who hopes for a boy to join in with playing sports or ogling fast cars may well be disappointed when their son simply doesn’t share their interests. I don’t think there’s anything wrong with introducing your children to things you take pleasure in, and perhaps even hoping they might like them too, but I also think it’s very important to allow children to develop their own interests and values. Children need to be their own people without feeling pressured to conform to some ideal or to be like their parents. It strikes me that parents who have strong feelings about gender might often put this sort of pressure on their children, whether they are the ‘preferred’ gender or not. Either the child struggles to live up to the expectations that the parents have attached to their gender (the boy has to like football or the girl has to be pretty like mummy) or they feel they’ve failed before they even do anything, as they’ve been born the ‘wrong’ gender. Having since gone on to have a second boy, and again feeling that momentary twinge of disappointment, I can rationalise that having boys was the best thing for me. I think that part of my desire for a girl was to have that little mini-me, someone to share my thoughts and to teach about the world the way I see it. Of course, I can still do that with my boys, but perhaps the gender difference between us will remove some of the intensity and pressure that might otherwise have been there. Having experienced growing up as a girl, I think I know what it’s like and how girls feel. In reality, I know what it was like for me, and how I felt. Having boys is like a blank slate; I can parent without imposing my own experiences and expectations too heavily on them. I also get the benefits of hand-me-down clothes! Emotionally I might have just a little bit of longing left for the daughter I’ll never have, but with my sensible head on, I know that my boys are just as wonderful as any girl could ever be. Now that they’re here and part of our family, what matters is who they are as people, not what gender they happen to be. Once again, the Gallery prompt this week had me scratching my head. 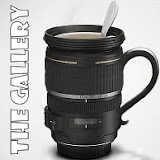 I’m hoping that taking part in the Gallery will help me improve my photography skills, so I didn’t want to simply look up a photo from a celebration past (and anyway, the vast majority of those will have been taken by my husband). So instead, I took this. This is my charm bracelet. I wanted this bracelet for a long time: I distinctly remember sitting in my room at university, playing with the online bracelet designer on my laptop. That would have been early 2004. I showed it to my boyfriend, as a not-too-subtle hint. He didn’t actually buy it for me until August 2008, when we had our first child. By then they’d become much more popular, and I’m a bit gutted now that every other person seems to have one all of a sudden (including my sister-in-law and worse, my mother-in-law). But I still love mine because each charm means something special to me. 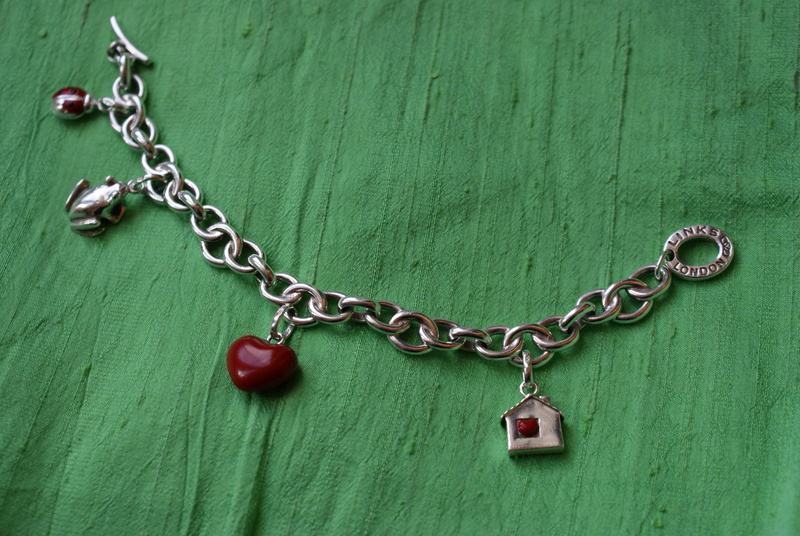 The red heart was there when I received the bracelet from my husband. He’d written on the gift card “To Mummy, with love from Daddy and Baby”. You see, he wrote the card and packed it up before we went to the hospital, before we knew whether our baby would be a boy or a girl and what his name would be. Since the day we celebrated our son’s birth, I’ve worn this bracelet every single day. He bought me the frog as we celebrated our first Christmas as a family of three. The frog represents our little newborn son, all curled up and tiny with his legs pulled up tight in a ‘froggy’ position. I smile now to think that our lives were both so consumed with caring for our son that I was happy to receive a Christmas present that was all about him. I received my most recent charm in April, when our second son was born. The house with a heart represents the fact that, for us, our family is now complete. Our home is full of love and happiness and we don’t need anything else. And that is definitely something to celebrate. 1. Despite the fact that he’s bursting with energy until 2.00 pm and an afternoon nap means that bedtime will be 8.00 pm at the earliest, my toddler is decidedly NOT ready to drop his nap. Tantrums and chaos will ensue. 2. Spending an entire day in the house with a baby and a toddler, thus avoiding the wind, rain and chilling cold, will seem like a good idea when you’ve exhausted all your energy and patience simply trying to get everyone dressed in the morning. Come mid-afternoon, lashing rain and icy winds will be sorely tempting. 3. The day you make these crappy decisions will be the day that Daddy texts at 6.00 pm to say that he’ll be in the office ‘for hours’ yet. 4. Mummy, whiny toddler and large plastic space station together in a wendy house is a very tight fit indeed. 6. All of the above, cumulatively, can make one feel somewhat trapped in a gripping, monotonous, claustrophobic housewife hell. Today I bought a pair of jombats. Apparently they’re the new jeggings. ‘Jeggings’ (and their smarter, grown-up sister ‘treggings’) were bad enough. What’s wrong with calling them trousers? Or in the case of jeggings, how about ‘denim-look leggings’? Is it to do with the internet (and with Twitter in particular? ): our demand to constantly consume information at a rapid rate means that every concept must be given a natty abbreviation? As much as I find ‘jeggings’ and ‘treggings’ irritating, at least they make sense. Jeans + leggings = jeggings, and indeed, jeggings are somewhere between the two, too substantial and styled to pass for leggings, but too stretchy and light to be skinny jeans. The name is annoying, but at least I understand the purpose of it. But these jombats are on a whole other level of irritation. The word origin is simple (although not so simple that they didn’t need to explain it on the website): jeggings + combats = jombats. Except, they’re not really anything like jeggings. They’re not at all stretchy. They’re basically combats, made from normal, sturdy cotton. That happen to be cut quite narrow at the ankle. But, worse still, even if they were made from elasticated fabric, they still wouldn’t be imitating a pair of jeans. They’re similar to leggings, not jeggings. So surely they should be called lombats (which sounds like some sort of Australian bush creature) or cleggings (and I don’t know many women who want to be reminded of the deputy prime minister when shopping for the latest fashion). I’d like to see a widespread campaign against this and other silly uses of the English language. Let’s call a spade a spade, and enjoy our ‘slim fitting combats’. Sadly the shop today didn’t have my size in stock, so you will have to wait three to five working days for my order delivery and a quick snap to accompany this post. I thought this one was nicely composed with the big engine a third of the way across, but looking at it now it maybe looks a bit weird because that one is further forward? But I do like the bright primary colours. This one came out how I wanted it (I took a few that didn’t!). 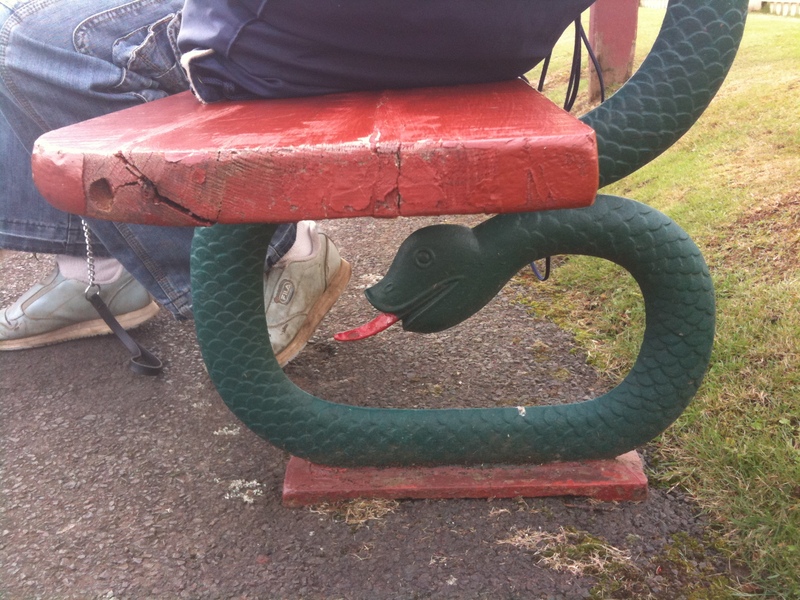 It’s a bench on the station platform. I had to get down on my knees and close into the bench to take this. I felt a bit of a fool at first, but then I asked myself why – do I really care if a couple of people on a station platform might think I’m a bit odd? No – I’m trying my best to be over caring about that sort of thing! 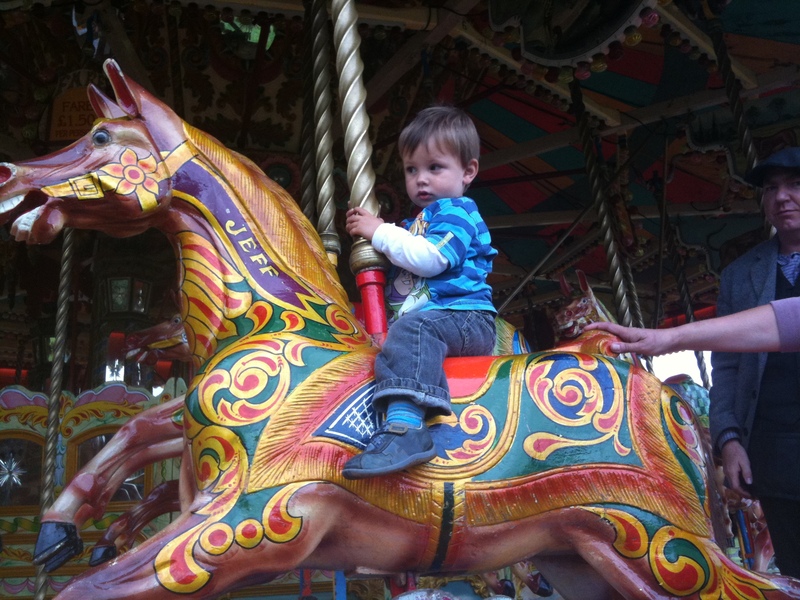 I like this one because it captures how apprehensive my son was about getting on the carousel. I wouldn’t have put him on it at all, but the friend I was with was really keen to take him on. We were the only ones there so the operator ran it especially slowly; the toddler looked pretty nonplussed throughout, neither enjoying it nor actively disliking it. I also like the juxtaposition of the horse’s gaudy pattern and his fabulously mundane name. This is my favourite. 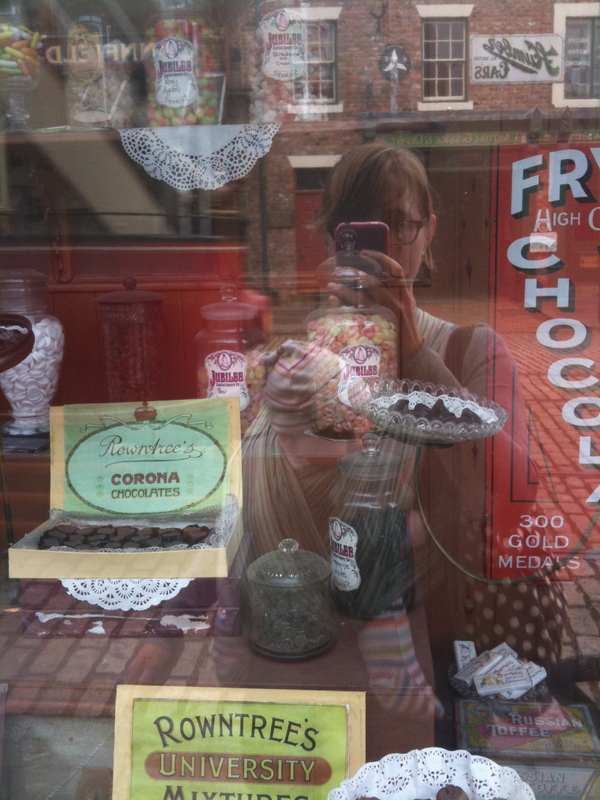 I was intending to take a quick snap of the sweets displayed in the window, but the bright light meant that the reflection appeared almost as clearly as the things inside. I like the image of me with my iPhone incongruous in the 1910’s scene, and I was delighted that I snapped just as a tram passed in the background. I still have a lot to learn, but I’m pretty pleased with these little pictures, and looking forward to taking some more.